VISITORS will be welcomed to the listed grade II* Croft Barn at Whitecastle Vineyard, Llanvetherine during this year’s open day organised by The Village Trust on Bank Holiday Sunday, August 26th from 2 – 5pm. The Trust worked in partnership with the barn’s owners, Robb and Nicola Merchant to conserve the barn with the aid of grants from Cadw and Heritage Lottery Fund. Timbers in the barn have been dated back to late 1500s. During the restoration work distinctive oak wattle panels in the walls were conserved and replacement ones crafted; the high doors of the threshing barn were renewed and the original cruck trusses and wall timbers used to create the barn frame were repaired. Local stone was used to cover the floor of the barn where threshing of corn was originally carried out. The barn sits at the edge of the productive vineyard planted by the Merchants, alongside Trerhew Brook. The barn was built as part of the Great Trerhew estate and was originally larger than it stands today. Members of the Trust will be on hand during the open day to talk to visitors and there will some craft activities for children and refreshments on offer. Entry is free, there is parking and toilet facilities and the site can be accessed by wheelchair. Interpretation material used on open days includes a moving augmented reality ‘farmer’ on a tablet who describes the barn’s purpose in English and using the original Welsh common to the area in Elizabethan times. 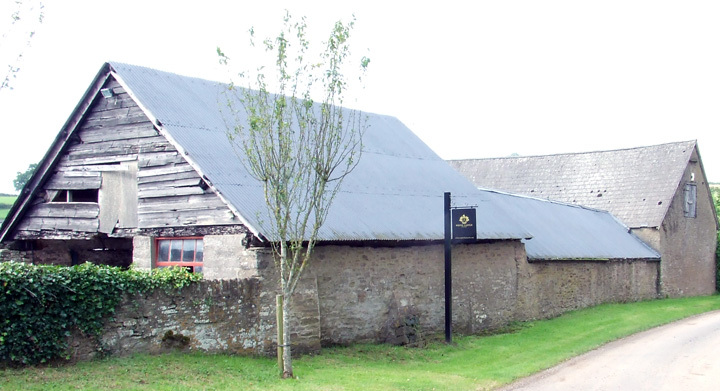 Cadw have pledged a grant funding towards emergency works at Croft Barn. The Croft Farm Barn is one of two barns at Croft Farm. They are linked by a lower block of single storey storage buildings, forming a range of traditional agricultural buildings along the roadside. The Croft Farm Barn is the northern barn and is listed by Cadw as grade II*, acknowledging its historic importance. Originally a corn barn, it is (currently) in a poor state of repair and on the Register of Buildings at Risk. However, the owners, who run The White Castle Vineyard at the farm, plan to restore the building and make it available to visitors. To this end they have sought the help and advice of the Village Alive Trust. Please contact the Trust to donate to this project. Renovation saves ancient listed barn. MIDSUMMER Day saw the official launch of the renovated 16th century Croft Barn at White Castle Vineyard, Llanvetherine which has been removed from the listed buildings ‘at risk’ register thanks to funding from Cadw and the Heritage Lottery Fund. The Wine and Heritage Alive in Monmouthshire (WHAM!) project spearheaded by local buildings preservation trust and charity, The Village Alive Trust, carried out the restoration work in partnership with Robb and Nicola Merchant of White Castle Vineyard. The barn was formerly part of the adjacent Great Trerhew Farm where the Trust has also renovated a larger corn barn which featured in BBC One’s first Lambing Live broadcasts. Guests at the launch of the restored Croft Barn toast the renovation work with White Castle Vineyard produce. Both buildings are listed as grade II* and the next public open day will be held on Sunday, September 6 from 2 – 5pm. Over 120 guests and interested people attended the Croft Barn launch and enjoyed a talk on the barn, tour of the adjacent vineyard, homemade teas, ice cream from Kelsmor Dairy, children’s activities and craft demonstrations by local artisans. Guests included Monmouth MP David Davies, Sally Edwards of the Heritage Lottery Fund and representatives of Monmouthshire County Council as well as neighbours, past owners and project supporters. and project partners Robb and Nicola Merchant, of White Castle Vineyard. Mr Davies congratulated the Village Alive Trust on its conservation work with local heritage buildings since it was set up in 2004 and Sally Edwards said she had great expectations for the WHAM! project. Trust vice president Edward Holland said, the Croft Barn had now been removed from the register of listed buildings in Monmouthshire which were deemed to be ‘at risk’ and was one of the few remaining barns of its type in the county. The barn is being used as a learning space for heritage and viticulture activities, including maypole dancing for local schoolchildren. Places are still available to book for some events this Summer including wine and heritage tours and a talk on Monmouthshire Houses by historian Grant Muter. David Davies, Monmouth MP, tries his hand at making a chair spindle coached by traditional Welsh chair maker Elizabeth Rowan at the Croft Barn launch and open day. The Village Alive Trust is a community-based building preservation trust, run by volunteers. 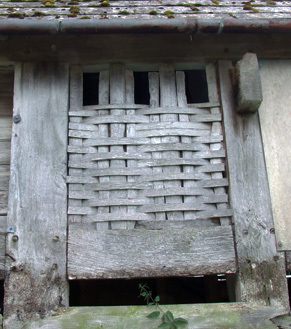 Our aim is to help conserve important vernacular buildings in rural Monmouthshire. Obvious remedial work is required to the barn and the Village Alive Trust has already commissioned a condition survey including dendrochronological report, a schedule of necessary repairs and an estimate of anticipated costs. The work includes stripping off and replacing the roof finish, repairing the timber frame structure and stabilising the walls. Using this information the Trust hopes to move forward with the owners in obtaining funding for the building’s repair, conservation and re-use. The traditional buildings of Wales relied heavily on the use of timber as a building material with the dominant form of construction being the cruck-truss. The cruck-truss consists of a pair of curved oak crucks set in the shape of an ‘A’ and crossed at the apex to form forks to support the ridge-piece. In Wales we have over 800 surviving cruck buildings. However, they are relatively rare in south-east Wales. Cruck-truss construction was gradually superseded by the box-frame, built up from a grid of vertical posts connected by horizontal tie-beams. The frame then supported the triangular roof trusses, made up from separate pieces of timber. Above: original wattle panel intact in north wall. For the construction of a barn, where the primary function was to keep the crop dry but to let in plenty of fresh air, undaubed wattle was often used. Oak-framed barns with wattle panels were common in east Wales until about the eighteenth century, after which good quality timber became scarce and the use of stone became an alternative. A common problem with timber-framed barns was the deterioration of the gable ends, constantly exposed to the weather, and many gables were indeed eventually rebuilt in stone. The traditional layout of a corn barn consisited of a central threshing floor with two high doorways at either side facing each other. These openings let in plenty of light to assist the work of the threshers, fresh air and the draught necessary to winnow in the barn. In bad weather during the harvest, carts could be brought in overnight and unloaded the following day. Most barns had two bays on either side of the threshing floor. Sometimes, as at The Croft, one bay would be lofted and used for keeping straw. A low partition would serve to separate sheep at shearing time, when the barn would be almost empty. 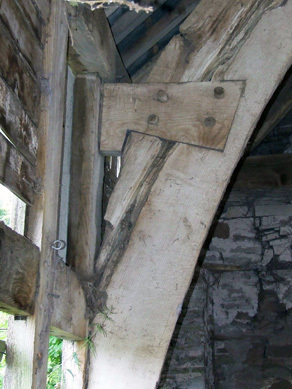 Above: detail of sixteenth century carpentry on eastern cruck-truss. The barn at Croft Farm followed the traditional layout of 5 bays, the central bay used as the threshing floor, two high doorways and undaubed wattle panels in the walls. The grade II* listing statement dates the barn as circa 1550. However, a recent dendrochronological report claims the timber used for the the frame was felled in the Spring of 1581 and it is likely that the barn was constructed later that year. The original barn was probably completely timber-framed. The eastern gable (road side) was rebuilt in stone during the seventeenth century. The barn is currently four bays – it is likely that the original western bay has been lost, probably undermined by a stream that runs close by, and the gable has been rebuilt in more recent times. The Croft Farm Barn was originally recorded in “Monmouthshire Houses” (1951-54), a study of the county’s vernacular architecture by Fox and Raglan, which includes a floor plan, elevation and photograph of the building. At that time the barn was known as the Barn at Great Trerhiw, Llantilio Crossenny. The photograph of the barn (the north elevation) clearly shows a low stone wall with horizontal timber boarding to the middle height, and wattle panels above. It was also noted that this barn is the only cruck-trussed barn showing the original framing of the entry and that, even though the uprights are substantial, they are comparatively thin. Fox and Raglan suggested that doors were not originally hung on either jamb, raising speculation as to how the floor was kept dry when used for grain storage. They also noted that stone roofing tiles had been replaced with Welsh slate. However, the original roof would probably have been thatched. Croft Farm Barn is an historically important structure. There is clear evidence of its sixteenth century origins and the cruck-trusses show important examples of superior carpentry. It is also remarkable that some of the oak wattle infill panels have survived. 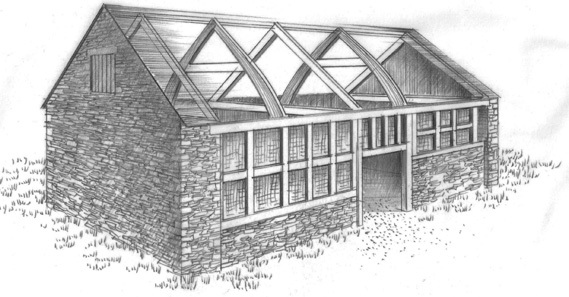 illustration of barn (with roof removed) showing alternating cruck-trusses and box-frame trusses, based on 1953 survey by Fox and Raglan. 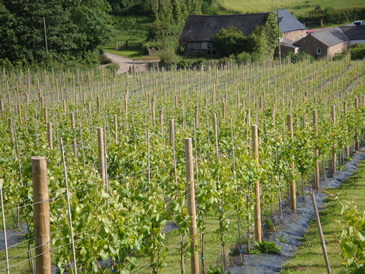 White Castle Vineyard occupies 5 acres of south facing land at Croft Farm, Llanvetherine. Following intensive research into vineyard management and selecting the most suitable grape varieties, the proprietors ordered the first vines in November 2008. A contractor was hired to plough the site and to plant the vines, but the family-run business has put up the 40 miles of posts and wire to support the vines and cut plastic mulch around each plant to keep the soil moist and the weeds down. It took two and a half years from the initial planting to the first harvest in September 2011. The grapes are hand picked and pressed on the same day at the Three Choirs winery in Newent, producing red, white and rose wines for sale from the vineyard shop. The first harvest has gained the vineyard Protected Designation of Origin (PDO) from Wine Standards, allowing the produce to be labelled Welsh Quality Wine. When the vineyard reaches full production it should have the capacity to produce 12,000 bottles of wine a year, including sparkling wines. Leaflet design and illustration: Eric Evans (c) 2012. Additional thanks to Robb and Nicola Merchant. 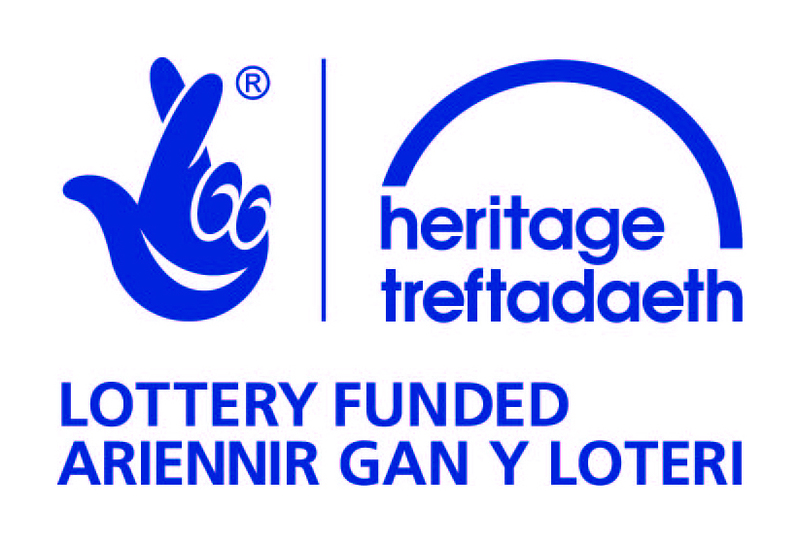 The Village Alive Trust – A Company limited by guarantee registered in Wales. Registration no. 5148543 Charity Commission no. 1107216. Registered Office: Yew Tree Farm, Llangattock Lingoed, Monmouthshire NP7 8NS.